It's hard to believe that the legislative session will begin in less than a month. Legislators will return to Des Moines for their 100-day legislative session on Monday, January 8, 2018. If this were a weather forecast, we'd tell you storms are ahead. Iowa's 150 legislators will have no shortage of challenges this year, and chief among them will be balancing the budget. The state is short about $90 million for this current fiscal year, which began on July 1, 2017. New revenue estimates released on December 11 show a budget that is spending more money than collected. Legislators will need to act quickly in January to cut current-year budgets by $90 million, and prepare a new budget for the next fiscal year that is equally bare-bones. The only other alternative is to find new revenues (that is, raise taxes). These new revenue estimates are important, because the Governor bases her fiscal year 2019 (FY19) budget on them. Governor Reynolds will have to make tough decisions on spending in her first budget, which she will present to the Legislature on the second day of session (Tuesday, January 9, 2018). Tax Reform: There is discussion about the elimination of the state's income tax, more property tax cuts, and a plan to increase the state's sales tax by a penny, using the first 3/8 (about $170 million) for water quality and the remaining funds for mental health and disability services (removing the MH/DS property tax and replacing it with state funds), education, and other tax reforms. Water Quality: Legislators came close to passing a plan to clean up Iowa's waterways, but were unable to get it across the finish line. There is a bill held over from last year that is only one vote away from passage, so it is very possible that this could be done early in session. Bottle Bill: Grocery stores are leading a charge to get rid of the state's landmark 5-cent bottle deposit law, aka "the bottle bill." This is very controversial, but its not a partisan issue. There are Republicans and Democrats that want to keep Iowa's bottle deposit law, and an equal number that want to make a change. Many local organizations use bottle deposits to raise money, and some redemption centers work with local disability service organizations to create jobs in their community. It'll be an interesting showdown. Mental Health & Opioids: Law enforcement is driving a lot of the discussion on both of these topics, because of the huge increase in overdose deaths hitting our state, and the lack of services that is forcing sheriffs and police officers to drive individuals experiencing a mental health crisis all over the state looking for help. In addition, two lobbyists lost family members in the past year to opioid addiction, and have told their personal stories to the legislators they see daily. Several work groups and committees have worked on this over the interim, and will have recommendations. Lawmakers are serious about doing something - but without additional money, it may be tough. Our first issue of 2018 will review the recommendations in these reports (they are being finalized now). There are a lot of other issues that lawmakers will try to tackle - Medicaid managed care, tobacco tax increase, public retirement (IPERS) changes, and education funding. As always, expect the unexpected when lawmakers return in January. If you have an issue, now is the time to get it on your legislators' radar. Call, email, or write your legislators and ask them to help! Starting next year, Iowans will be asked to show identification in order to vote. Voters can use an Iowa driver's license or non-operator ID, but that is not an option for 123,000 registered Iowa voters who don't have that identification. If you do not currently have an Iowa driver's license or ID - watch your mailbox! This week the Secretary of State's office began mailing out new Voter ID cards that will make sure every Iowan in the state will have identification to use when voting. 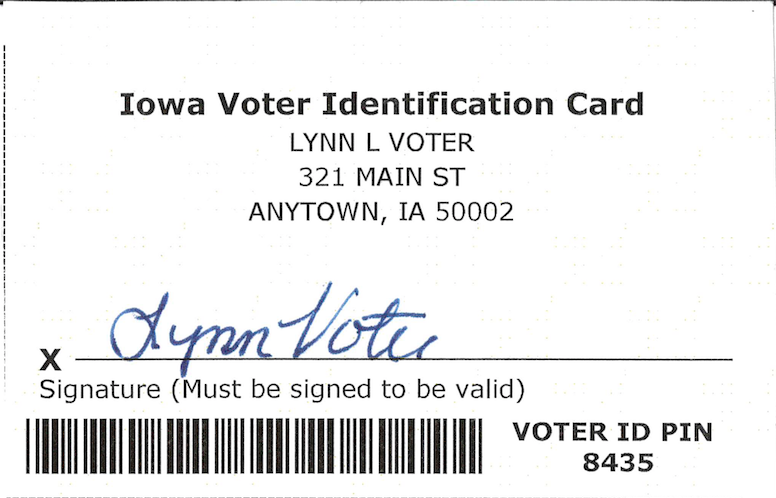 Iowans receiving these new "voter Id cards" will need to show them when voting. Only Iowans without a current Iowa driver's license or ID will get these cards. If you are mailed a new Voter ID Card, put it in a safe place! You will be asked to show it when voting. If you forget in 2018, election officials will simply ask you to sign a form. However, that will not be an option in 2019, when the law will be enforced. So make sure you keep your Voter ID card safe! An audio clip of Secretary Pate’s quote is available here. A picture of the envelope the cards will arrive in is available here. A sample picture of the new Voter ID card is available here. Frequently asked questions about the new Voter ID law is available here. If you have a valid Iowa driver’s license or non-operator ID you will not receive a voter ID card. Only registered voters who do not currently have an Iowa driver’s license or ID issued from the Iowa DOT will receive a Voter ID card. If you do not receive your Voter ID card before the end of the year, and think you should have received one, contact the Secretary of State's office at sos@sos.iowa.gov or (888) 767-8663. If you lose your card after receiving it in the mail, you will need to contact your county auditor’s office for a replacement card. If you move, update your voter registration and a new Voter ID card will be mailed to you (if you don't have a driver's license or ID). The updated Voter ID Card will be mailed to your new address. Beginning January 1, 2018, voters will be asked to show their ID before voting at the polls. Anyone who does not have the necessary ID will be asked to sign an oath verifying their identity, and will be allowed to cast a regular ballot. No eligible voter will be turned away. Beginning January 1, 2019, Iowa voters will be required to show a driver’s license, non-driver’s ID, passport, military ID, veterans ID, or Voter ID Card at the polls before they vote. Voters without the necessary ID may use an attester (a voter from their precinct to verify your identity), or they will be offered a provisional ballot and can provide ID up until the time of the county canvass of votes (Monday after election day for Primary and General Elections). Again, no eligible voter will be turned away, but you may have to do some follow-up in order to have your vote count. On December 12, voters in Plymouth and Woodbury Counties chose a new State Senator. Rep. Jim Carlin (R-Sioux City) was elected to the Iowa Senate, replacing Sen. Bill Anderson, who left to take a new job in Cherokee County. Rep. Carlin, who defeated Le Mars Democrat Todd Wendt by 603 votes in this heavily Republican district, has served one year in the Iowa House of Representatives. Rep. Carlin will need to resign from his House seat before being sworn in as a State Senator. Once he does this, the Governor will call another special election to fill his House seat (House District 6). With the holidays and session approaching, the special election may not be called until February. that follow. We continue to update it as we get new information. You can find the most current version (dated 12/13/17) of the 2018 Guide to the Iowa Legislature here. Once committee assignments are confirmed, we will be printing and mailing the Guide to all of you that are on our email or mailing list. If you know of someone that would like a free copy of this great advocacy resource, email us and ask to be added to the infoNET list (call 866-432-2846 or email us at www.idaction.org/contact_us/). The state's move to Medicaid managed care has been rocky from the beginning. Every week there is another twist that threatens the stability of the system. It's no surprise that many Iowans with disabilities are confused, scared, and angry. In the past month, AmeriHealth Caritas has left the state and all of its members were moved to United. About 10,000 former AmeriHealth members had asked to change to Amerigroup, which didn't have capacity. Instead, the state is temporarily managing their care until Amerigroup has capacity, or another MCO is added. But no one knows what "temporary" means. Last week, United began telling providers that they would be ending the successful Integrated Health Home (IHH) program for AmeriHealth transfers that are not receiving habilitation or children's mental health waiver services. This impacts approximately 5,000 Iowans with disabilities, and could be effective at the beginning of the year. If you are unfamilar with the IHH program, it was created in 2013 to help Iowans with serious emotional disorders and serious mental illnesses receive the support they need in the community through intensive care coordination. Ironically, the IHH program was created by a managed care organization (Magellan) to improve outcomes, allow individuals to experience recovery while living safely in their communities, and ultimately save Medicaid dollars. Let people know what's going on with your Medicaid services. Tell your story. You can do this through traditional means - emails, letters, calls, visits. Or you can use social media to get your story out. Tweet, post on legislator facebook pages, or send them a videotaped advocacy message. In 2018, we will be collecting video advocacy messages throughout the session, and sending them to legislators. Use your smart phone or YouTube to tape a 3-5 minute message. What's working? What's not? What can your legislators do to help? You can send us your video messages at infonet@idaction.org. Talk to your lawmakers. Legislators have been hearing stories like yours for the last year, so do not hesitate to share yours. If you do not want to make a video, email or call your legislators (or invite them to sit down over a cup of coffee to talk). You can find out how to contact your legislators here. In the words of former First Lady Eleanor Roosevelt, "Do one thing every day that scares you" and "It's not fair to ask of others what you are not willing to do yourself." So take action - even if it scares you! The Iowa Department of Human Services (DHS) has hired a new Medicaid Director. Michael Randol has been appointed director of the Iowa Medicaid Enterprise (IME), where he will oversee the $5 billion program that serves more than 600,000 Iowans each year. Most recently, Randol was Kansas' State Medicaid Director, another state that has had its challenges with managed care. Prior to that he was the Veterans Services Manager with the Kansas Department of Commerce, Vice-President with US Bank, Director of Accounts Payable for a large privately held company, and Budget Manager and Lead Auditor for local and state governments. Randol retired from the United States Air Force, after assignments in New Mexico, Colorado, Illinois, California, Okinawa Japan and North Dakota. He has a Master's in Business Administration with an emphasis in Finance, as well as a Bachelor of Science in Accounting. Medicaid Directors may not get a lot of personal time, but when he does, Randol enjoys spending time with his family, which includes two children and eight grandchildren, and pursuing his passion for woodcarving. He must also enjoy challenges!